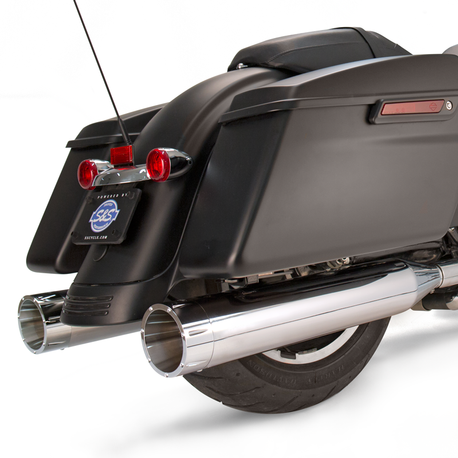 Mk45 Slip-On Mufflers are the result of decades of riding, racing and tuning. Combining both a stainless steel perforated core baffle with RaceTEX cartridge packing, they create a deep rumble and improved horsepower and torque, all while adding a unique look with styled aluminum end caps. Let me start by saying I usually don't write reviews, but I was so impressed by these mufflers I really have to share my experience. First of all, I'm a regular motorcycle hobbyist with mechanical skills and have had four HD bikes along with eight other lessor brands throughout my 26 years of riding/tinkering. I'm a recreational rider who works full time, so when I do ride, its 400mile+ run! I have used S&S engine components in past (most recently 110ci engine upgrade) and have always been impressed by the engineering and quality of their products. But, I have never used their exhaust products. I have always been a V&H faithful and used multiple products from them on various motorcycles. However, upon completing this last engine build, I found my V&H Hi-Output mufflers to be lacking low end performance due to being too free flowing and, at speed, had a droning sound that would leave my ears ringing on a long ride with most recently coming back from 2018 AZ bike days. So, a couple of weeks later while the 2018 Laughlin River Run, they had ton of venders with real displays including S&S Cycle and Vance and Hines(other possible model)! Both vendors were able to demo all sorts exhaust for me for my review. Although, both companies made quality products, S&S seem to be a notch above engineering, quality, sound and innovation. The S&S MK 45 had a db reducer that is genius! I also found it to be so easily removable and easily installable. And, what a great thing to have loud deep exhaust note when riding short trips, and nice mello deep exhaust note on long distance runs! So, the choice was to buy the S&S Cycle mk45 but, they came with so many different end cap options and all were awesome looking! The choice wasn't easy but I ended up withMk45 Chrome Tracer End Cap - Chrome Body Finish - 4.5" Slip-On Muffler. Installation was easy and the product is high quality! The Mufflers also tuned very quickly with my TTS Master tuner. 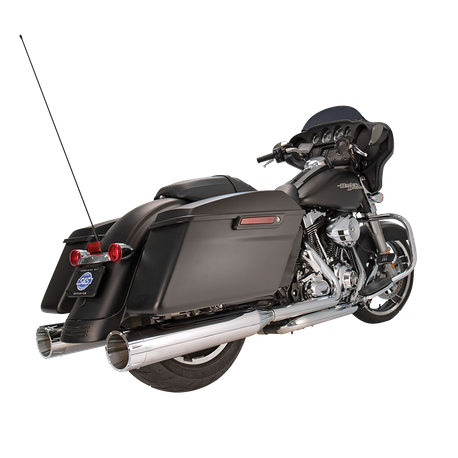 The performance of these pipes exceed those of the V&H high outputs with noticeable seat of the pants torque nice mello deep exhaust with the db reducer installed. 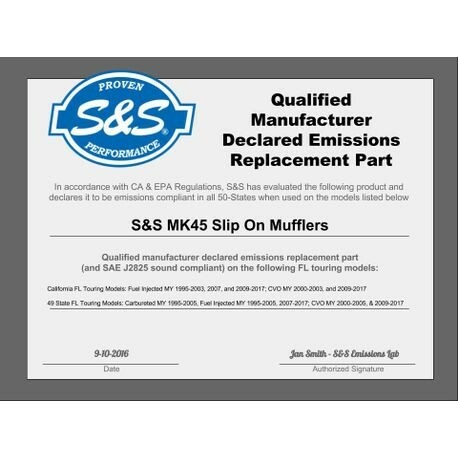 By the way, the db reducer is included with the S&S mufflers, unlike V&H. They will charge you extra for a "quiet baffle" that is very noticeable when installed and, in my opinion, does not look very good. The only negative thing I can say about the S&S Cycle mufflers, is that their shipping packaging is lacking. There was no protection for the Chrome Billet end caps other than styrofoam wrapping and plastic. And oddly enough , the front Muffler metal chromed inlets are protected with secondary cardboard wrapping? They the Mufflers I purchase did arrive thankfully. But, only due in part to the fact that this product is fairly new and the vendors hadn't shoveled these around in there stock very much. I can see with a month to years of storing these, shuffling them around on shelving, moving them around on the floor, that the shipping packaging will not protect the mufflers themselves and we'll eventually arrive damaged to the end user. *Qualified manufacturer declared emissions replacement part on the FL touring models listed below.